In God is Not One: The Eight Rival Religions That Run the World, New York Times bestselling author of Religious Literacy and religion scholar Stephen Prothero argues that persistent attempts to portray all religions as different paths to the same God overlook the distinct problem that each tradition seeks to solve. Delving into the different problems and solutions that Islam, Christianity, Buddhism, Judaism, Confucianism, Yoruba Religion, Daoism and Atheism strive to combat, God is Not One is an indispensable guide to the questions human beings have asked for millennia—and to the disparate paths we are taking to answer them today. 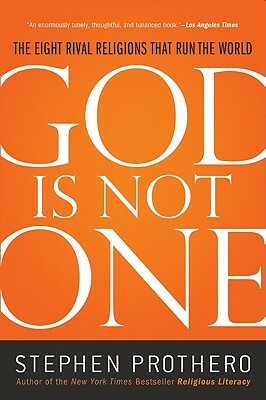 Readers of Huston Smith and Karen Armstrong will find much to ponder in God is Not One. Stephen Prothero is the New York Times bestselling author of Religious Literacy and God Is Not One and a professor of religion at Boston University. His work has been featured on the cover of TIME magazine, The Oprah Winfrey Show, The Daily Show with Jon Stewart, The Colbert Report, NPR, and other top national media outlets. He writes and reviews for the New York Times, The Wall Street Journal, Boston Globe, The Washington Post, USA Today, Los Angeles Times, Salon, Slate, and other publications. Visit the author at www.stephenprothero.com or follow his tweets @sprothero.